Cloudy with periods of rain. Low 43F. Winds N at 15 to 25 mph. Chance of rain 90%..
Cloudy with periods of rain. Low 43F. Winds N at 15 to 25 mph. Chance of rain 90%. The Register/Andrea Howe Mary Katherine Deming demonstrates Double Dutch jump-rope to youngsters at the MTC Fit "Jumping for a Cause" clinic Monday. While volunteers braided jump-ropes from T-shirts to be donated as part of Operation Christmas Child, youngsters learned the basics of jump rope and Double Dutch jump-rope. The Register/Andrea Howe Meagan Steckler braids T-shirt strips into a jump rope that will be donated as part of Operation Christmas Child's shoebox campaign. Volunteers Emily Goodson and Leatha Brown and others were cutting the shirts into strips Monday at MTC Fit's Double Dutch "Jumping for a Cause" free jump-rope clinic. 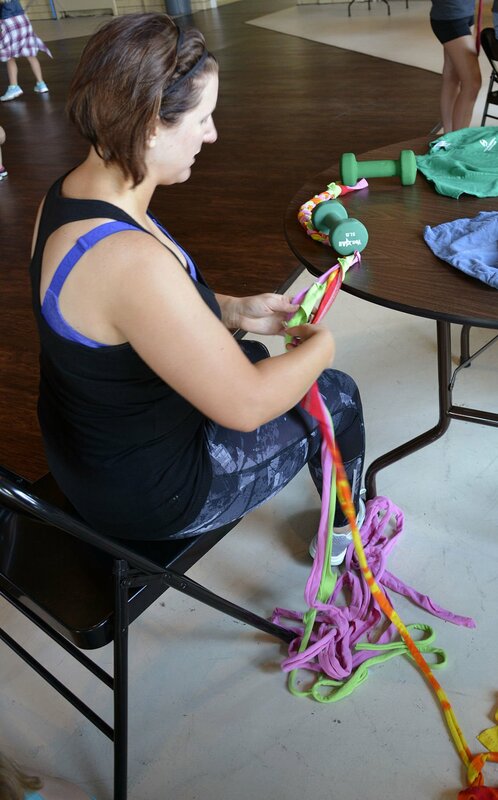 Steckler said it takes about three T-shirts to make enough strips to braid one jump-rope. The Register/Andrea Howe Elise Thomason (right) talks to Hattie Newkirk about entering the jump rope, manned by Judah Kight and Zac Cirunay in Monday morning's MTC Fit Double Dutch jump rope making party and clinic. While volunteers made jump ropes to be donated as part of Operation Christmas Child, youngsters learned the basics of jump rope and Double Dutch jump rope.